Shattered Throne - an action-packed fantasy series from Cate Dean. Welcome to the coastal city of Palamar, capital of the rugged, windswept Western Realm, in the land known as Farren. 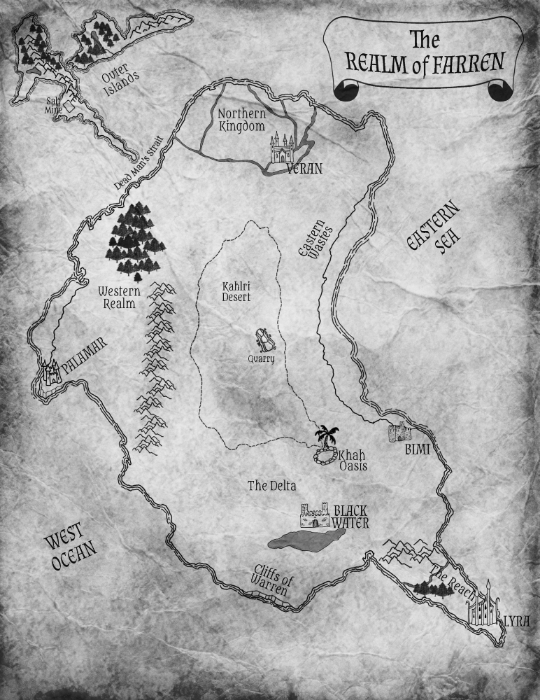 Map drawn by Katie at Magic Owl Design. As the entry point for trade across the island, it is a melting pot of race and religion, often simmering, sometimes boiling over. The prequel to an exciting new fantasy series. *Includes a sneak preview of Shattered Throne, Book 1 of the Shattered Throne series. Book 1 of an exciting new fantasy series. Six months after Micah Brachon's abduction, little has changed. He spends his time building projects in his workshop, and trying not to think about Raine Ashmead, the Shira half-blood who walked into his life, and his heart. But when his brother Liam is attacked, inside the walls of the castle, their temporary reprieve is over. A faceless group wants power, and will use any means necessary to achieve it. Liam discovers this after he is ambushed and taken from the life he knows. Thrown into a world where the rules are profoundly different, where he no longer has control over his future, he must adapt, or die. With Liam gone, Micah steps into his place, uncertain of his ability to do so, and far from ready. He needs to figure out who he can trust, and quickly, before the traitor among them shows their hand, destroying everyone he loves. Book 2 of the exciting fantasy series. With his brother gone, Micah Brachon has taken on the role of Duke of Palamar. When the traitors who had his brother enslaved reappear, Micah must step forward, and become the Duke his people need. It is a role he never wanted, but one he takes on, to move Palamar forward, and keep the kingdom safe for Liam's return. Micah has to believe that his brother will return. Liam Brachon is surviving in the desert Oasis. As a slave, his life is not his own, but he has found that his mind is - and he can use his mind to plan, to find a way to escape. When he is framed for murder, he is thrust into a role that he may not survive. Friends in unexpected places give him hope, and for the first time since his abduction, he believes he might have a future beyond the pain. But that future may not be what he expects - or wants.